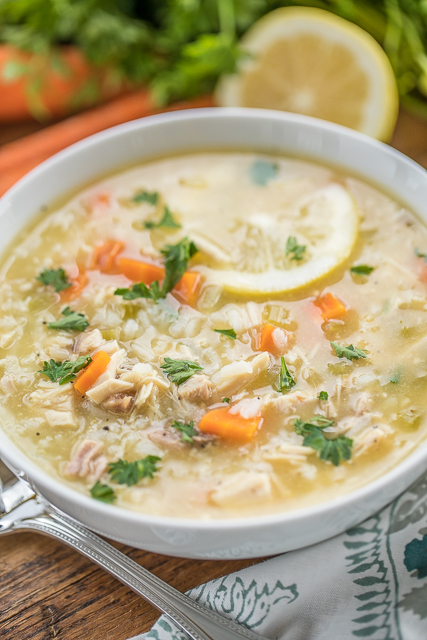 This Low-Fat Greek Lemon Chicken & Rice Soup is AMAZING! Out of all the low-fat, low-carb recipes I made this month, this was the one that Chicken Legs loved the most. He is still talking about this delicious soup! I have it on the menu again this weekend. 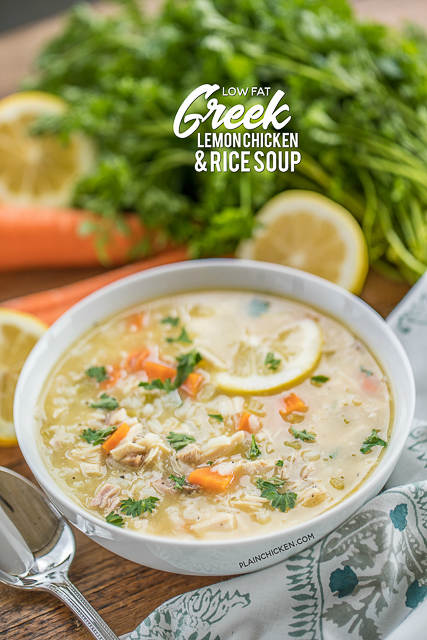 This Low-Fat Greek Lemon Chicken & Rice Soup is stupid easy to make. Just put everything in the pot, bring to a boil and simmer for about 20 minutes. You are really just heating up the soup and cooking the rice. 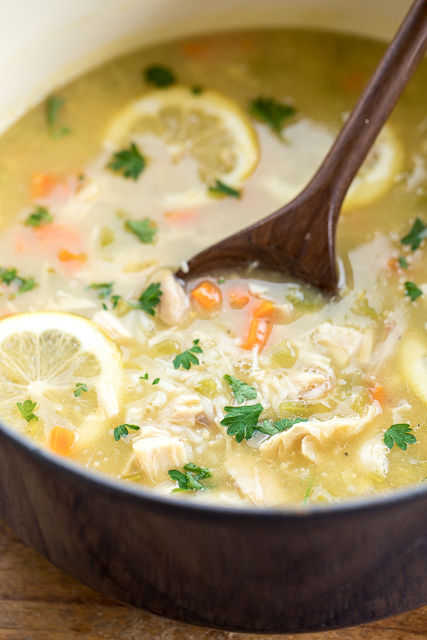 I used rotisserie chicken for the cooked chicken in this soup and it worked great. The flavors are AMAZING in this soup. The lemon and Greek seasoning really make the soup. I used Cavendar’s Greek Seasoning in this recipe. You can find it in the spice section at the grocery store and Walmart. 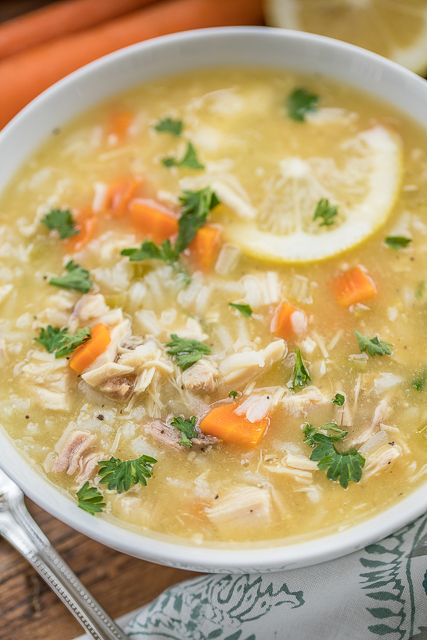 Give this Low-Fat Greek Lemon Chicken & Rice Soup a try ASAP. I promise that no one will ever guess that this is low-fat. 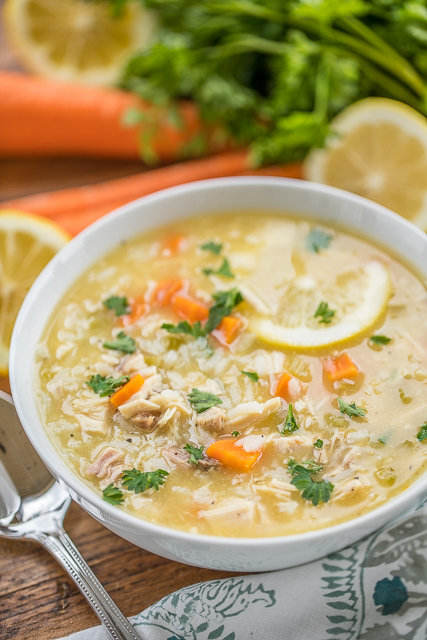 There is so much delicious flavor in the soup that you will never miss the fat! Combine all ingredients in a large Dutch oven. Bring to a boil. Reduce heat to simmer and cook 20 minutes, until rice is cooked. do you think it would work okay with brown rice? Yes - you will just need to adjust the cooking time. Brown rice takes longer to cook than white rice. I made this today and it is awesome! Thanks for sharing. SO glad you enjoyed it! We are making it again tonight - SO good!! I really enjoy Greek food and this looks like an easy and super delicious variation of a soup I like. Putting the ingredients on this weekends grocery shopping list now!